Yitzchak Kolangi, Amir Menashe, Maor Harush, Elior Preis, Kochava Shriki, murdered in Burgas, laid to rest Friday. Yitzchk Kolangi (Itzik) of Petach Tikva, 28, who was murdered in Burgas by terrorists, was laid to rest Friday at Segula Cemetery in Petach Tikva. His brother eulogized him, saying: "Thank you for being my brother – you are my brother forever." "I will never forget you. I promise you that the family and I will guard over your wife, Gilat, and your daughter, Noya, who resembles you. My dear brither, watch over us from above." Gilat, Itzik's wife, is hospitalized and could not attend the funeral because of her condition. 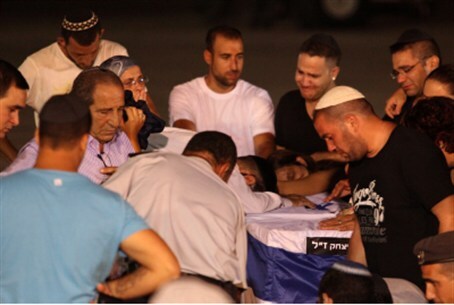 Ttzik's friend Amir Menashe, 28, also of Petach Tikva, was also laid to rest at Segula. His wife, who was injured in the terror attack, attended the funeral in a wheelchair. Maor Makhluf-Harush of Akko, 25, was laid to rest at the Nahalat Asher Cemetery near Kfar Mecher. His good friend Elior Preis, also from Akko, will be laid to rest at the cemetery at 4:00 p.m.
Kochava Shriki, 44, of Rishon LeTzion, was laid to rest at the Rishon LeTzion Cemetery. May their memories be blessed and their blood avenged.